ECJ Decision on software licenses: On July 3, 2012, the European Court of Justice (ECJ) issued a landmark decision related to the copyright protection of software licenses. The ECJ ruled that the conclusion between parties of a user license agreement, accompanied by the transfer from the copyright holder to the customer of a computer program, for use for an unlimited period of time in exchange for a fee constituted a “first sale”. Hence, copyright holders of software in the European Union (EU) exhaust the right to control the sale of their copyrighted software when they first sell it, so long as the copyright holder is not able to use the licensed software after resale. The case involved the software giant Oracle, and rival firm UsedSoft, which trades in “used” software licenses. Oracle distributes software online by licensing the software to customers. Once customers enter into a licensing agreement with Oracle, they have an unlimited right to download the software from Oracle’s website and to install as many copies as specified in the licensing agreement. UsedSoft acts as a broker for used Oracle licenses, allowing Oracle customers who no longer need their licenses to resell those licenses to another firm. The cause of action occurred when UsedSoft offered used Oracle licenses to customers allowing them to download Oracle software directly from Oracle’s website. Customers who already possessed the Oracle software could go on to purchase licenses for additional users and then download the software to the workstations of those additional users. Oracle sued UsedSoft, arguing that UsedSoft was infringing on its copyright by facilitating the resale of its used licenses given that the software license agreement explicitly stated that the Oracle software licenses were non-transferable. Ruling over questions referred to it from a German court, the ECJ determined that there was a valid transfer of property rights in Oracle’s copyrighted software when customers downloaded a copy of the software and concluded with Oracle a user license agreement for an unlimited period of time. The court likened such a transaction to a “first sale” which exhausts the copyright owner’s interest in the material object such that the one who buys the object is entitled to resell it. In other words, the ECJ held that resellers like UsedSoft are not bound by the terms of the license agreement prohibiting the resale of software when they obtain, for a fee, the right to use the software for an unlimited period of time. The “first sale” doctrine was deemed applicable even though a copy of the Oracle software was downloaded straight from the internet in an intangible form. The ECJ held that in this instance, the doctrine is not restricted because there is no tangible copy changing hands. Hence, where the copyright holder makes available to his customer a copy – tangible or intangible – and at the same time concludes, in return for payment of a fee, a license agreement granting the customer the right to use that copy for an unlimited period, that right holder sells the copy to the customer and thus exhausts his exclusive distribution right. Further, even though companies buying used licenses are considered as making a reproduction of the software when they download a copy of the software, such reproductions will be considered legitimate under the Court’s ruling so long as the first acquirer, at the moment of resale, makes unusable any copy they had downloaded. The ECJ does seem to make a distinction between selling a license and selling the right to use intellectual property. Under the Court’s application of the law, “[i]f the license acquired by the first acquirer relates to a greater number of users than he needs, that acquirer is not authorised by the effect of the exhaustion of the distribution right to divide the license and resell only part of it”. Hence, the reseller is not allowed to split a multi-access license into different parts and subsequently allow it to be resold individually. Although the rationale of the judgment does not apply to rented software, as the concept of copyright exhaustion only applies to software first ‘sold’ within the EU, the ECJ decision has the potential to create a significant market for used software licenses in the EU. Software developers will now have to find other ways to protect their interests by reconsidering giving license users the right of use for an unlimited period of time. In the UAE, Federal Law No 7 of 2002 in Relation to the Rights of the Author and Neighboring Rights (Copyright Law), protects any creative work in the field of literature, or the arts, or the sciences, of whatever kind or manner of expression, or whatever its importance or purpose. UAE Copyright Law, like the copyright laws of most nations, follows the Berne Convention. Article 12 of the UAE Copyright Law applies to computer software and protects it from unlicensed exploitation. Using, copying and downloading software, downloading materials from websites on the internet or distributing any material in any manner, for any purpose, commercial or personal, without the author’s written permission constitutes copyright infringement with limited exceptions. Further, under Article 13, any disposal by the author of the author’s original copy of the work does not result in a transfer of the author’s financial rights, unless otherwise agreed. Accordingly, under UAE law, software that is made available subject to a license agreement is protected by the provisions of that license agreement. Although there is no precedent we can look to for guidance regarding the principle of copyright exhaustion in the UAE, we expect that software made available to a customer with a user license agreement will be governed by the terms of that license agreement, irrespective of whether the term of use is for an unlimited period of time. In the UAE, computer software is protected from unlicensed exploitation by the Copyright Law; hence transfer by the copyright holder to a customer of a copy of a computer program, accompanied by the conclusion between the same parties of a user license agreement means that the customer only has the right to use the software subject to the license agreement. It is unlikely that the UAE courts will interpret the transaction described above as a “first sale” wherein the copyright holder is deemed to have exhausted their right to distribute the software once they execute, for a fee, an unlimited license agreement with a customer. 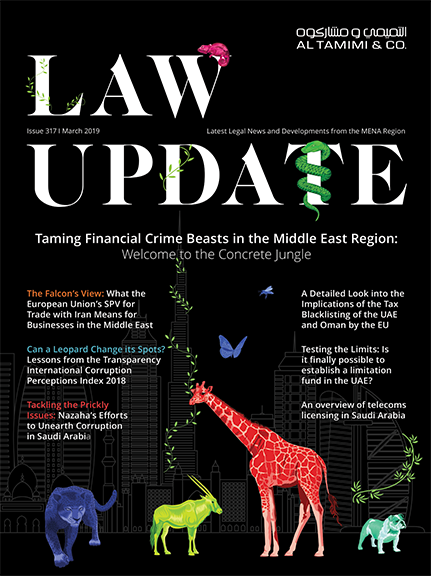 However, even though the ECJ decision may not have an immediate impact on the Copyright Laws in the UAE, the decision sets an unanticipated international precedent with the potential to change how software licenses will be viewed going forward. Al-Tamimi & Company’s Technology, Media & Telecommunications team regularly handles issues relating to licensing of software in the region. For further information please contact David Yates at d.yates@tamimi.com or Sana Saleem at s.saleem@tamimi.com.